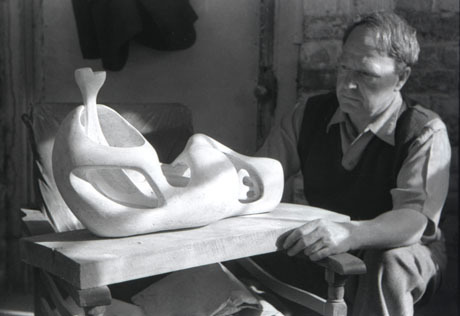 Visiting The Henry Moore Foundation at Perry Green, Hertfordshire is the ultimate experience for any Moore fan, art enthusiast and those wishing to learn about one of Britain’s greatest 20th Century artists. The sheer beauty and tranquillity of the place, with its rolling grounds dotted with a stunning array of Moore’s outdoor sculptures effectively melts cares before one even arrives at the door of the Sheep Field Barn Galleries where Henry Moore deluxe: books, prints and portfolios is housed. This insightful exhibition, allowing views into yet another aspect of Moore’s prolific artistic outpouring, is the last one curated by Head of Collections and Exhibitions, David Mitchinson, who has worked for the Foundation since it opened in 1977, alongside of Moore himself until the artist’s death at the age of 88 in 1986. Mitchinson also designed the comprehensive book accompanying the exhibition and had formerly been involved with the creation of other Moore tomes, including a book focusing on Henry and Irina Moore’s beloved home, Hoglands, which is also on the grounds at Perry Green, along with several of Moore’s smaller, natural light-filled studios, among them Bourne Marquette Studio where one is afforded rare glimpses into Moore’s fascinating working processes. This exhibition is a very important one, in that it is the first to centre exclusively on Moore’s etchings and lithographs, of which there are 719 in total, with the 363 featured in deluxe books and portfolios being focused on here. Although the exhibition seems rather compact at first glance, on closer inspection one realises that it is more than comprehensive, as it offers looks at rarely seen examples of a multitude of Moore’s themes and subjects, some of his own favourites among them: Elephant Skull, Sheep, Stonehenge, Animals in the Zoo, The Artist’s Hand, Mother and Child and Trees. There are also lithographs Moore made to accompany W. H. Auden poems in the early ‘70’s, as well as several examples of gently siren like women, some portrayed resting on a beach, from a volume of his renderings of reclining figures among other items of artistic note. The artist who accompanied me was especially taken by Moore’s sensitively detailed etchings and lithographs of his own hands. Having loved looking at art for as long as I can remember and being privileged to be able to write about it over the past four years, necessitating closer examination, I’ve ascertained that, in my opinion, many artists, be they abstract, as Moore tends to be, (although his work is somewhat figurative, albeit, always, according to his own vision rather than a strictly life-copying one), can best be judged on the basis of their drawing, as that medium effectively forms the very bones of their work, much in the way that back writing (only seen if famous) does for authors. Those artists, whose drawing is infused with feeling, whether adding tangibility to their subject and/or, in terms of emotions, come across most successfully in the long run in that they have more of a tendency to be able to draw viewers into their other, more ‘finished’ works. Naturally, I’ve only been able to come to terms with that thinking through viewing the drawings and paintings and/or sculptures of an artist on a more or less even keel. In Moore’s case, for example, his drawing of two sheep almost seems to be a portrait of dignity as well, as he has, rather amazingly, conveyed a sense of his respect for these simple animals, many of which graze on the late artist’s grounds today, among his sculptures. There are other intriguing angles to consider in this exhibition relating to artistic technique as one has a chance to appraise Moore’s way of building up on a theme, most notably, through his Sculptural Ideas, a myriad of progressively more detailed etchings bringing him ever closer to his desired final effect. Then there are the contours of this printed work to admire and ponder over, such as in the Stonehenge drawings where the ancient stones Moore so obviously admired almost seem to assume lives of their own. Following an enjoyable visit to the exhibition, during which personable and knowledgeable volunteer Amanda Green lent welcome insight into Moore’s works as well as about what it is like spending time on the grounds, in the company of sheep or, not, as the case was when we were there, we headed over to Moore’s home Hoglands. The house was, as we’d expected it to be, a warm and lived in former home, with one large, rather formal visiting room for the entertaining of guests, some of whom we assumed had been VIPs. The ‘real’, smaller sitting room was much cosier, though the larger room housed some of Moore’s personal art collection, both primitive and ‘modern’ among it, paintings by Coubert and a selection of Latin American art, much of it from Mexico. In the narrow kitchen, I was intrigued by the fact that there was an ice box standing against one wall, and amazed at the revelation from a volunteer that it was still in working order even though it had been purchased by the Moores in 1940. Things just aren’t as they used to be in our throw away culture. We also admired the fact that although Moore became a millionaire in his lifetime, he lived simply, only buying what he needed and putting the rest into The Foundation, which has helped many other less fortunate artists realise their creative dreams since its inception in 1977 and will hopefully, continue to do so for many years to come. You can help that cause by visiting The Foundation and its compelling collection of sculptures and other Moore artworks from March to October, with the added bonus of being able to enjoy its relaxing and welcoming atmosphere, whatever the weather. If you were to ask if I had any regrets about my first visit to Moore’s creative world at Perry Green, I would only have one. That I wasn’t there long enough to see all of his studios and spend as much time as I would have liked strolling through the grounds, visiting more of my favourite sculptures. When (not if) you do go to The Henry Moore Foundation, plan on arriving for its opening and staying until closing time, and don’t forget to visit the excellent Visitor’s Centre/Gift Shop on your way out.